Comm Eye Health Vol. 10 No. 21 1997 pp 10 - 13. Published online 01 March 1997. Like most countries in Africa, Senegal faces the distressing problem of blindness. With a population of between 7 and 7.5 million inhabitants, the number of blind people is about 70,000, a prevalence rate of 1%. Jouni,1 on the basis of the 1979 census (4 million inhabitants), gave the figure of 50,000 blind people, a prevalence rate of 1.25%. Blindness was of corneal origin in 44% of cases (bacterial keratitis, trachoma, onchocerciasis); of lens origin (cataract) in 21% of cases; of intraocular pressure origin (chronic glaucoma) in 10% of cases; and, finally, of mixed anterior and posterior origin in 15% of cases (e.g., onchocerciasis, trauma). Set up in 1955 in the suburbs of Dakar, the BOPP Centre plays a significant role in the fight against blindness in Senegal. In particular, since 1970, the appointment of an overseas voluntary ophthalmologist has led to the creation of a mobile ocular surgery unit. From July 1990 to August 1991, 1,000 cataract patients (eyes) received surgery at BOPP, approximately 40% of the operated cataracts in Senegal during this period. In 1990, by comparison, 640 cataracts were operated on at the hospital in Tambacounda, 300 at the Principal Hospital, 250 at Le Dantec Hospital and 200 at Saint Louis Hospital – a total of 2390.
post-operative: early or late complications, VA at two months. Data collection was done by a team including a surgeon and nurses who had specialised in ophthalmology. Pre- and post-operative visual acuities were measured with the E Snellen scale at five metres. Approximately 95% of the patients came from within Senegal. The remaining 5% were from bordering countries (Mali, Mauritania, The Gambia, Guinea-Bissau). No precise numerical data were available on the ethnic origin of the patients but, according to a sample of our patient population, we estimated that Wolofs, Serers, Peuls and Toucouleurs represented more than 75%. All operations were performed under local peribulbar anaesthesia (xylocaine 2% + marcaine 0.5% + hyaluronidase). subconjunctival injection of antibiotics and corticosteroids. posterior chamber lens: 112 eyes (ECCE). 7 detachments of Descemet’s membrane. a) Pre-operative visual acuity (VA). For 22 eyes, VA = between < 3/10 and 1/10 (<6/18 and <6/60). b) Post-operative visual acuity corrected with spectacles at 2 months (Table 3). Results for 774 eyes: 571 ECCE and 203 ICCE. It should be noted that 226 patients(22.6%) were lost to follow-up, which is a high percentage of defaulters. c) Early post-operative (from day 1 to day 15). Complications are itemised in Table 4.
d) Late post-operative (at 2 months). Complications are itemised in Table 5. It is difficult to know whether the male predominance means that males present for surgery more than females or simply that males have a higher prevalence of cataracts than females. Among the patients, 54.8% were over 60 years old. While cataracts remain an ailment of the elderly, they also involve young adults and the middle-aged (210 of the patients were between 20 and 50 years old). We could not correlate anatomical type and aetiology of cataract. Complete cataracts represented the majority of cases (62.2%) accounting for the very low pre-operative visual acuities. Intumescent cataracts were very frequent in patients over 50 years old. Identification of aetiological factors for cataracts is very difficult. Congenital cataracts (1.2%) are often underestimated. Very young and uncooperative patients were excluded and referred to another hospital owing to the lack of general anaesthesia. Traumatic cataracts (traumatic perforation or contusion) represented 5.1% in our study. 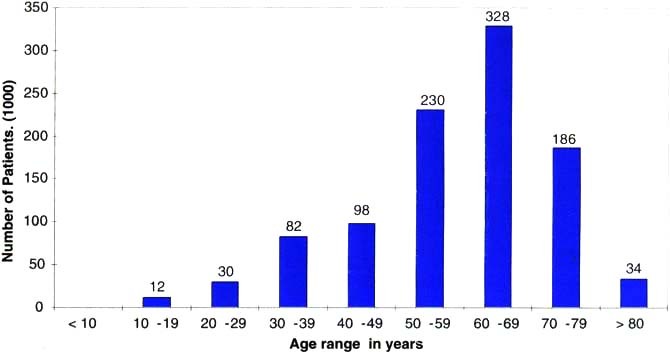 Most were in young individuals (44 of 51 patients were less than 40 years old). The group of secondary cataracts (6.8% of cases) was difficult to evaluate. Diseases producing secondary cataracts (e.g., uveitis, diabetes) or iatrogenic causes (long-term corticosteroid treatment) could not be clearly identified by clinical history or examination. other unidentified factors: e.g., genetic, endocrine. There was no significant difference between the functional results of eyes having surgery using the intracapsular technique and those operated on by the extracapsular method. human factors concerning the patient: agitation, coughing, etc. The patient who had the expulsive haemorrhage had arterial hypertension. There were 4 ECCE (with no intra-operative complications) and one ICCE with vitreous loss. One eye received an implant. Two of the 5 patients were diabetic. Search for ENT or dental sites of infection could not be done. The lacrimal system was patent in all 5 patients. No means were available to isolate any organisms. Since no antibiogram was available, we treated the endophthalmitis systematically with an intravitreal injection of gentamicin, a series of subconjunctival injections of gentamicin and an oral antibiotic. One case, 3 months after surgery (ICCE with vitreous loss). Three cases, at one month after surgery during the first post-operative visual acuity examination. It was not possible to determine whether these retinal detachments were pre-operative. We did not have any ocular echography, and ophthalmoscopy was not possible before surgery because of the lens opacity. surgical procedure with the insertion of an intraocular lens (without any viscoelastic product). difficulties during implantation with air, leading to endothelial trauma. Various questions are posed by this study. 1. Is ECCE preferable to ICCE? ECCE offers well known advantages:4low frequency of vitreous loss and cystoid macular oedema. However, the risk of opacification of the posterior capsule is great, and in the absence of a YAG laser, a second surgical intervention is necessary (needle capsulotomy). ICCE is easy to perform but may lead to several types of complications: including endothelial corneal decompensation by the intact hyaloid prolapsing into the anterior chamber. 2. Should an IOL be used? functional: in this respect, the advantages of implantation are no longer debatable. economic: implantation on a large scale cannot be envisaged unless manufacturing companies are willing to supply implants designed for the developing world, respecting quality assurances and financial needs. technical: patient selection must be rigorous. Implantation with no viscoelastic product is delicate. One has to keep in mind the risk of endothelial decompensation and corneal oedema which can be disastrous in countries where corneal transplants are not possible. 3. How can endophthalmitis be prevented or treated? prevention: our approach uses very simple means such as disinfection of the surgical area (skin and conjunctival fornix) with povidone iodine3 and a subconjunctival injection of antibiotic at the end of surgery. Economic goals: gentamicin is easily available and not expensive. Bacteriological goals: gentamicin is a wide spectrum bacterial antibiotic which is effective against gram negative bacteria and staphylococcus.6 It was effective in most of our cases of endophthalmitis. Pharmacological goals: an intravitreal injection gives highly efficient concentrations of antibiotics.3 A subsequent subconjunctival injection can also be used. Cataracts remain a major cause of blindness in Senegal. In our experience, ECCE is a good solution provided that (1) there is adequate technological support; and (2) a posterior central capsulotomy is done. As regards aphakic correction, IOL is advantageous in well-selected patients. 1 Jouni H. La cécité au Sénégal. Mémoire pour le D.I.S. d’ophtalmologiste. Bordeaux 1989. 2 Queguiner P. La cataracte. Clinique ophtalmologique 1990; 1: 31-3. 3 Groupe d’Etudes Epidémiologiques et Prophylactiques. Symposium international: prévenir et trailer l’infection en chirurgie ocularie (communication orale). Paris. 26 Janvier 1990. 4 Durand L, Burillon C. Les complications de la chirurgie du segment antérieur. Rapport SFO. Masson Edit, Paris, 1990. 5 Salvannet-Bouccara A. Endophtalmies. Laboratories Chauvin Edit, Montpellier, 1990. 6 Adenis JP, Denis F. L’endophtalmie. Ellipses Edit, Pans, 1988.